A great man passed away on Friday. He was a teacher disguised as a basketball coach. Although I was never on any of his teams and only met him briefly, he was a big influence on my life. 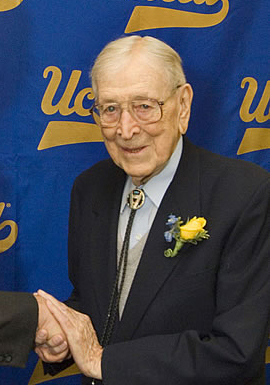 Coach Wooden was voted by sports writers as the greatest coach of any sport in the 20th century. His UCLA teams won 10 national championships, by far the most ever. But it was not these successes alone that made him such an amazing man. It was his values and what he stood for: the importance of marriage and family, character and integrity, sacrifice and teamwork. Preparation, preparation and more preparation. Focus on the effort and not on the results. A must read is “Wooden- A Lifetime of Observations and Reflections On and Off the Court” by Coach Wooden with Steve Jamison. It is an easy read, where it is best only to read a page or two at a time. You will learn what it takes to be successful and how to have a meaningful life. Two things that stick out most in my mind about Coach Wooden. One, some of his players say what they learned most from Coach Wooden is how to be a good husband by his example of how he was to his beloved wife Nellie. Two, the amount of preparation he put in to each practice; more time to prepare for the practice than the time it took to conduct the practice. I hope I learned these lessons well. The most important thing I can teach is how to be a husband and father; and, to maximize success, prepare, prepare, prepare. May he rest in peace and always be in our hearts.